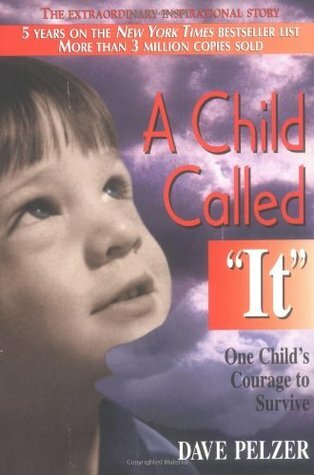 Title: A Child Called "It"
This is my second read through of the book and it still shocks me and disgusts me. So, so sad. However, it is like a car accident and you can't help but flip the page and want to know if this poor kid is going to make it alive. Of course he does because 1) this is the author's tale and 2) The first chapter says so. It still bummed me out that he pretty much tells the story of him being saved FIRST. Save it for the end...I know you live, but I want to see the journey and how long and how many things happened before he was saved. I know a lot of people call this a "fake" and it "never happened". I will admit...maybe some parts are over-exaggerated, but it happened. His brother and some other confirmed it. One younger brother and one grandma (who didn't even live in the same state) says its crap. 1) The Younger brother was not abused, he was a favorite and 2) The Grandmother was not even around during the years of the abuse....so yeah. Other people ask, "How in the world would he remember any of that in such great detail? SO it has to be fake." It falls along the lines of soldiers in war who remember every horrible memory and other people who were abused. My own mother was abused as a child and she can describe the scene as if it JUST happened. The human brain rarely lets horrible things go. Now...I will not suggest this book to those that have a weak stomach or who cannot handle child abuse. There are some graphic and really horrible scenes. I wish some scenes he would have brisked over, but alas that is not the way of the world. In the end...this is a quick read and it is simple. He wrote in his younger self's POV, which made me happy. It felt real. Yes, sometimes it gets too real, so again...weak-of-stomach or hates child abuse...stay away. Some scenes are graphic. However, I do recommend everyone read this book, because it is important. Not all cases are child abuse, but the ones that are is important and they need help. Out of five stars, I stamp this with 4 stars. Wow. After reading your review I still don't know whether I would like to read this one or not. Yes, it is like a horrible accident - you feel bad for watching but you cannot avert your eyes. Maybe. B, its a tough one. Ana, it's a must-read if you can stomach child-abuse.